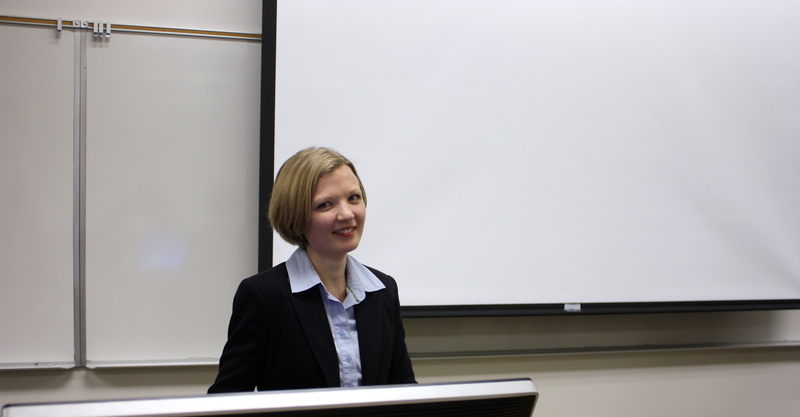 Dr. Katya Jordan, instructor of Russian from Virginia Polytechnic Institute and State University, addressed Dostoevsky’s measure of faith through his novel The Idiot. More than ten years after finishing The Idiot, Dostoevsky commented: “All those who have spoken of it as my best work have something special in their mental formation that has always struck and pleased me.” Why? Perhaps because The Idiot is the most personal of Dostoevsky’s major works, or because the book trifles with Dostoevsky’s most private convictions and doubts. Those who loved and praised the book were, in Dostoevsky’s perception, kindred minds and spirits. “The study of literature is the kind of intellectual endeavor that runs the risk of detaching itself from our everyday reality,” said Jordan, as we talk about characters who never really existed and events that never really happened. But, she remarked, we never really read Russian classics just for fun. In other words, Dostoevsky cherished The Idiot because, although the story is fictional, it represented his own intimate, real-life questions, and as Anton Chekhov – another Russian writer – stated: “A writer’s role is to pose questions, not to answer them.” Dostoevsky was a master of asking. What was Dostoevsky asking that was so intimate in The Idiot? “One of the great questions he poses is the nature of faith,” Jordan said. Going on, she remarked that he was challenging readers to decide whether the Gospel of Christ was really alive. The painting is about two meters long and thirty centimeters tall, an accurate tomb size. The body is life-size, and legend states that the artist used the body of a drowned man as a model. The unembellished, gruesome depiction of the crucified Christ is what makes the painting particularly notable. The painting portrays the dead Christ’s flesh beginning to rot, his body battered, and his face showing not only marks of spiritual and emotional grief, a common artistic trope of the time period, but also actual physical anguish. The novel’s protagonist, 26-year-old Prince Lev Nikolayevich Myshkin, declares that the painting, graphic and disturbing, has the power to make one lose his faith. Viewers can see the stark differences in the portrayal of Christ’s dead body when they compare Hans Holbein’s “The Body of the Dead Christ in the Tomb” to a Russian Orthodox icon, produced around the same time. Jordan compares Holbein’s work with Dionisy’s icon “The Crucifixion,” where we do not see any blood or bruising. “This is a stylized and idealized image of the body . . . and the face shows no signs of physical suffering, but only a profound sadness for the sins of the world,” she said. What Ippolit really wants to know, Jordan said, is what awaits him after death. Is resurrection a reality? Could it be? We gain an important insight in examining Dostoevsky’s personal copy of the New Testament (see Image 3). There is a dog-eared page in Hebrews chapter eleven, with a mark on verse one. “Faith is the substance of things hoped for, the evidence of things not seen,” it reads. The novel as a whole is perceived by some critics as hopeless and dark, because it engages in some of the most explicit questioning of the crucifixion to be found in Dostoevsky’s work. So, if this painting and novel could destroy ones faith, how could Dostoevsky – a Christian in good standing – say that The Idiot was his best work? Dostoevsky himself admired the painting “The Body of the Dead Christ in the Tomb,” and from a record kept by his wife, we learn that when Dostoevsky saw the original painting in Switzerland, he stopped in front of it, as if awestruck. “A remarkable artist and poet,” he said, referring to Holbein. Truly this painting was not aesthetically beautiful, but Dostoevsky admired it. Myshkin’s reaction to the painting in the novel is the same as Dostoevsky’s in reality. According to Jordan, the idea that the painting could both reinforce and destroy someone’s faith is not a contradictory concept. “For Dostoevsky, the essence of faith is found not with the help of obvious evidence, but in spite of overwhelming evidence to the contrary,” she said. Thus, in The Idiot, Dostoevsky presents readers with a powerful temptation to either lose faith in resurrection or to believe in things hoped for that are not seen. Dostoevsky himself said, “The miracle of resurrection is worked out for us deliberately so that later it would tempt us; yet we ought to believe, because this temptation (to stop believing) will be the measure of one’s faith. Katya Jordan is an instructor of Russian from Virginia Polytechnic Institute and State University. She earned a Ph.D. from the University of Virginia. Hebrews 11:1 (Russian). This is a facsimile edition of The New Testament, published by the Russian Bible Society in 1823. Dostoevsky received this book in 1850 as a gift from the wives of the Decembrists when he was exiled to Siberia (Courtesy of Katya Jordan).